Dear God, I forgive you for ruining my life! “Dear God, I forgive you for ruining my life…or at least I’m trying,” I finally confessed last week. Remember when I said that Annie’s heart defect wasn’t anyone’s fault? I’ve been struggling to believe that. Because I know that there is someone who could’ve made it different and didn’t. It’s that same old mystery: Where is God when bad things happen? Is God the angry king up there millions of atmospheric levels away waving his scepter to incite pain on the poor peasants who inhibit this lowly earthly kingdom? Is he the one who was too busy saving babies in China or feeding orphans in Africa or calming dust bowls in Oklahoma and didn’t have time to tend to the tragedy occurring in an Arkansas womb? No. Over this long journey I’m seeing firsthand that there is another option. God knew. God designed. God planned. God loved. God delivered. And then God showed up! I haven’t been in this darkness alone. Annie’s diagnosis shocked me. I was angry at myself for not praying for a healthy baby, but only praying for a girl. (I remember saying, “Any healthy baby is a blessing, but I’d like a girl.” Now I know that ANY baby is a blessing. Healthy or not.) I felt cheated because, even when we did get Annie’s diagnosis, I didn’t know to pray for her medical team in Philadelphia! I’d been praying for doctors in Little Rock all those months. I was unprepared, how could I have known to pray for my marriage too? I was selfish, why didn’t I think to pray for all the other families walking familiar cold, dark hallways while their child fought to live? It seems so unfair! How could I have known to be praying for all of these horrific details to somehow be right? Even though I didn’t, someone did. Even though I wasn’t, someone was. “Christ Jesus is the one who died—more than that, who was raised—who is at the right hand of God, who indeed is interceding for us” (Romans 8:34). Yes, Christ’s intercession on our behalf and God specifically having this story for our life is obvious in every minute detail. From doctors on call on just the right overnights, a coincidental opening in the #1 surgeon’s booked schedule, connections from Little Rock to Philadelphia, unexpected heart function recovery, and more, we know God has been with us every step of the way. We’ve seen so many miracles in Annie’s story. Yet, I’ll admit they’ve often not been the ones I’ve asked him for. The waves that rippled through our family aren’t settled. The fear over Annie’s tomorrow isn’t assuaged. She will never live with a whole heart. 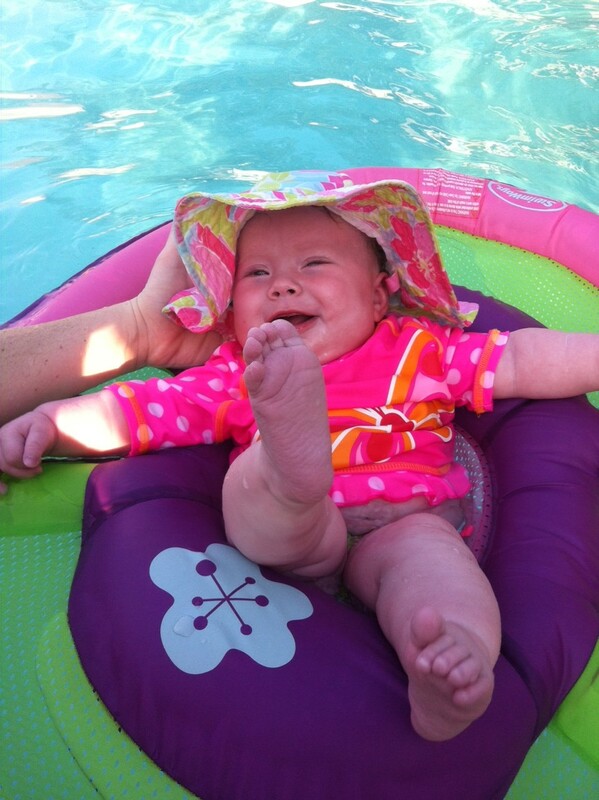 The haunting realities we’ve lived the past 4 months fighting for our daughter’s life will never be erased. But he has held Annie behind locked operating room doors when my arms wouldn’t reach and held me behind a locked up heart where I didn’t want to be reached. He has healed. He’s changed hearts–Annie’s and mine and untold others. There’s not a chapter of our story that’s authored by us. It’s all written by One who is the definition of wisdom, power, love, and grace. So as I’ve said before, This is God’s story and that makes it good. Toddler tired midday meltdown ensued. At the same time newborn diaper blow out covered my shirt, her entire body, and the rocking chair. The rocking chair that I needed to coax Audrey to sleep in—immediately. Well, that is if any of us were going to make it through the next five minutes. I decided to let my toddler lay squalling on the floor, hoping the lying down would put her to sleep. Not likely considering the ear-piercing volume of her afternoon fit. But I left her and rushed Annie to the changing table. I stormed through five wipes and two diapers and had her clean faster than a raceway pit stop. My mind raced to how I could entertain her to tend to my still awake, still crying 2-year-old. I set the baby in her crib beneath twirling bright pinks, oranges, and blues and clicked the Mozart switch. Maybe soft, calming music could drown out the next door tantrum. I prayed, “God, please just five minutes.” And ran to pick up the tired screamer. Three sips of milk and four rocks later, Audrey stopped short in her humming along of “Jesus Loves Me.” Just as I laid her gently in her big girl bed, I heard the baby start to fuss. I did it! I thought. I whispered a secret victory cheer in my head, applauding myself that I got Audrey to sleep in time to tend to Annie’s next needs. I bounced baby to the kitchen with me and texted my husband, “I should be somebody’s hero.” Doesn’t it feel that way sometimes? A seemingly short, half-an-hour motherly challenge requires such patience, such strategy, such precision that it seems we could surely earn a medal of honor. Or at least a quiet coffee break. And our days are made up of hundreds of those equally short, yet equally exhausting motherly challenges. I’ve found the way to press on through the tired seconds is to enjoy each one by realizing the sacredness that lies within it. On a recent road trip to admit our 3-month-old Annie for her second open heart surgery, we stopped at consecutive I-40 rest stops: the first for spit up fountain flood, the next for poop explosion (maybe it’s time for the next size diaper with the frequency of these), and the last for mixing up more formula without spraying it all over the backseat. Even in the frustration and “inconvenience” of these moments, I begged God for the continued privilege of rest stop sink laundering and roadside bottle mixing because it meant my baby girl would be healthy and heading home with us soon. So in the days of motherhood frenzy, I try to remember how much I’d really hate a silent afternoon of no rocking. I’d be bored without Barbies to dress. Our driveway would be plain neatly swept instead of decorated in family chalk art. And I’ve even grown to like the familiar stench of lingering diapers, because it means there are bottoms to wipe, faces to clean, and littles to love. Thank you, Jesus, for this gift of motherhood. Who wouldn’t love to mother this SWEET thing?! 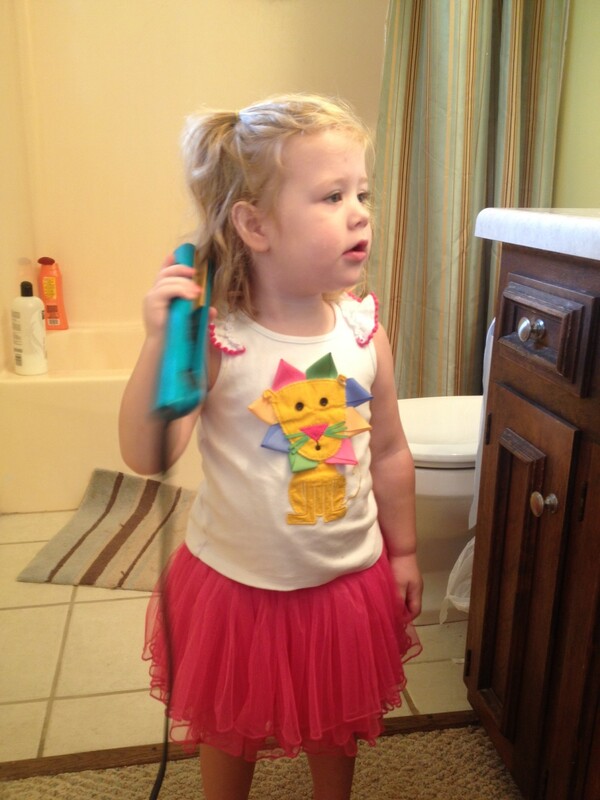 And this one who was “straightening her hair” for the circus. Watching my own heart warrior fight for her life with every fleeting breath is hard enough. But put me (or any heart parent) in a CICU surrounded by 100 frail babies and mommas doing the same thing and that is a lot–too much at times–to be part of. As hard as it is, it’s my only hope for personal survival. Because once you’re a heart mom, you’re immediately different from everyone else you’ve ever known. Even if the day before your child’s diagnosis you had every single thing in common with your best friend since birth, trust me, you don’t anymore. So you form relationships with others in the trenches. Those relationships are valuable but they’re also painful. Because once you’ve befriended the mother of the baby across the pod from you, you’re rooting for her baby too. When that baby is still there when you return six weeks later, you pray even harder and more frequently for healing. And when that precious life passes after you’ve hugged the mother that morning, you weep too. Every heart mom knows that it could’ve been, and could still always be, you. The code blue tweeters might announce your baby’s bed next. The tear-stained doctors’ faces might be over your news tomorrow. The rare and unheard of adverse reaction could be your child’s in a few short years. This is a burden that we heart families do not carry alone. It’s also a burden that isn’t quickly lightened when your child is the one who recovered well. I’m happy to say that Annie is doing great in the two weeks since surgery. She is back to her happy, social self. She is totally off pain meds. Her sats are a comfortable 85. And we don’t have to take her for a cardiology check up for another whole month! All great news to celebrate! But sometimes it doesn’t seem right. How can I be coordinating babysitting so that we can attend a wedding, when last week we were deciding what food to order in to Annie’s recovery room? It doesn’t seem fair when I picture the families who I know are still there wondering how many more times they can eat Jimmy John’s or Potbelly’s, when I see on their Facebook page that their child is still fighting desperately for his life, when we’ve seen three babies pass in the months of June and July. These are haunting realities for real families, real families who we are real friends with now. And at times we’ve been that family, hoping against hope to get back to any version of normalcy. Four months in survival mode, living the dark horrors of those hallways changed me. 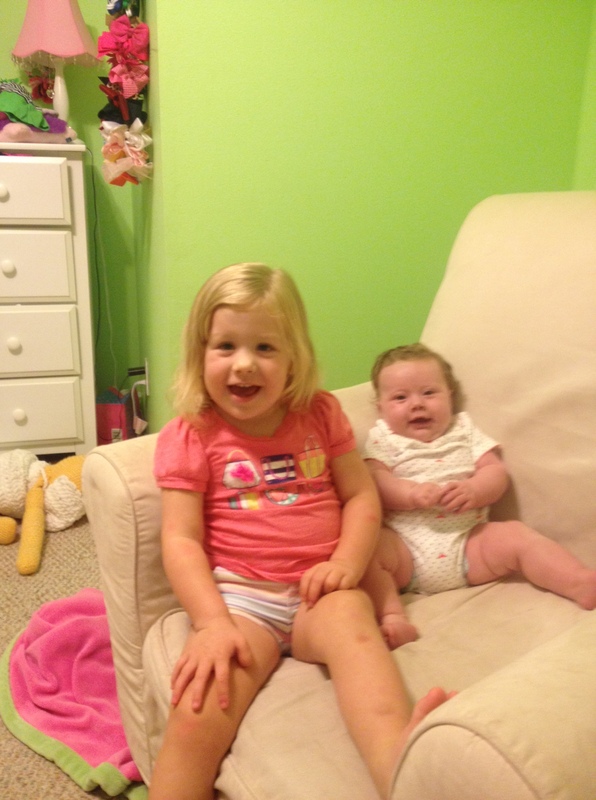 The truth of the continuous instability that comes with Annie’s diagnosis changed me. In some ways for good because now I know the sacredness of each second. In some ways for bad because I’ve found myself in a PTSD-like haze somewhere between CHOP terror and the pleasantries of Marlowe Manor park play dates. Truth is recently I cannot remember some names that match familiar faces or even my zipcode anymore. But precious families who are a few miles ahead of us on this journey have assured me that the nightly ghost sound of monitor beeps will grow fainter. The sting of hospital loss can be intentionally traded for the celebration of our everyday routine. And that I’ll become myself again. Not the self I was before who lived without compassion, who felt comfortable with only a mindless conversation, or who took things for granted. But I can be my new self. Who cherishes all kinds of frenzied moments because they are at least mine to be had, who is intentional in every setting with every person, and who knows what it’s like to have been sustained through the valley of the shadow of death. I will be someone who, instead of sadly mourns for the families still there, encourages my family and my girls to live fully the days that we have in honor of those who may never get to. 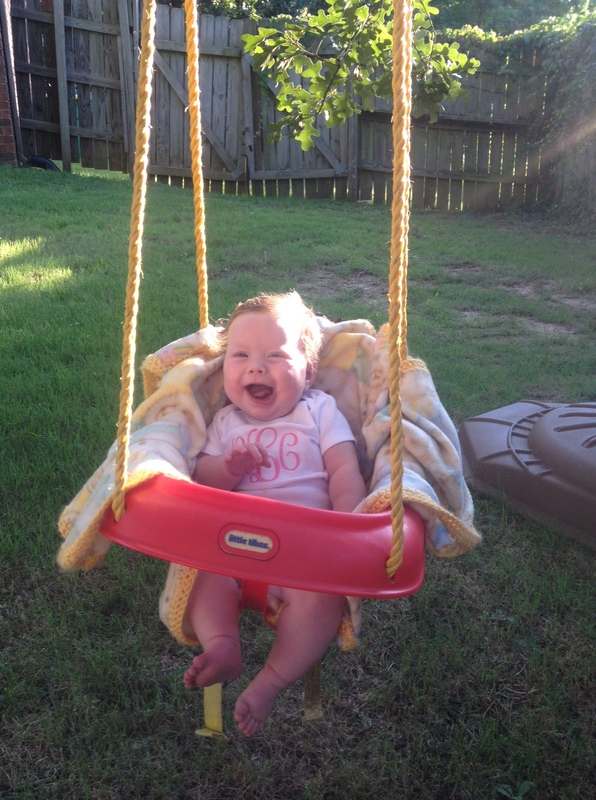 Annie is living it up in the swing! My girls love each other. Sunday morning, late for church. Settled into my passenger seat with news for the driver: pregnant. Yes, I checked twice. And yes, even the cheap, generic sticks I bought are supposed to be accurate. Sometimes I ache to go back to that day and make it different. Sometimes I think, But if we would’ve waited just one more month to try. One more day. We could’ve spared Annie from so much. From cold, lonely, bed-ridden days right out of the womb when we both wanted her swaddled tight and nestled against me. 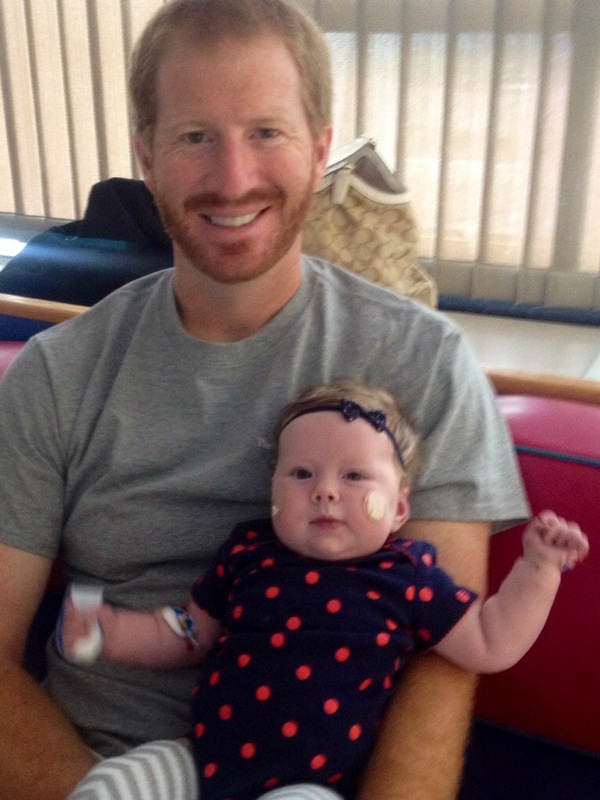 From a deep incision to break her sternum and cut on her 5-day-old heart. From hundreds of blood draw needle pierces and IV sticks. From weeks spent staring at hospital-tiled ceilings instead of my smiling face. From clinging to life and fighting with every pain-filled breath after yet another incision, sternal break, and more cardiac cuts. No one wants her child to endure such horrors in 3 short months. And another truth I’m not afraid to admit is that no parent wants to endure the horrors either. No one wants a child like that. But I know it couldn’t have, wouldn’t have, shouldn’t have been different. The most unloving thing I could do is “spare or save” my child from the life that God has for her. It’s beyond easy to naively think that my ideas for a healthy, normal Annie would’ve been better for all of us. God knew what he was doing when we were pregnant with one try. When it was Annie who showed positive on the sticks last August. And out of his great love, he made Annie with half of a heart and gave her to our family. And out of his great love, he’s drawing both of our hearts toward his through her precious, valuable life.